Yes I, large fat man, genius writer and reformed geek, will be at the Blake's 7 stand at this year's London Film and Comic Con where I will be available for chat, celebrity photographs (particularly if you are a celebrity) and to push as many copies of the Blake's 7 Audio adventures as I can. Remember if you buy a writer's CD he eats for a day but if you teach your friends to consume product I'll be able to replace my kitchen cabinets sometime next year. I've just reloaded Campaign Cartographer 3 onto my newly restored computer. Although my official work was all backed up amongst the many personal things I lost were my maps. I like to create worlds but they have the most tenuous connection to productive work and so, until that glorious day when I become hugely rich, I try and discourage it. Still; bird gotta fly, fish gotta swim, I gotta to create fantasy worlds. This is the first of my new worlds, I'm calling it Tradeland for now. I established point sources for certain vital trade goods and then trace out the trade routes between them. 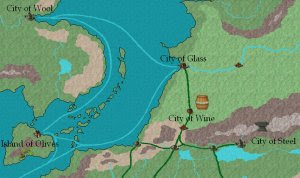 Secondary cities are placed where the trade routes intersect or pass over terrain boundaries (especially those on a north/south alignment). Then I'll link the secondary cities together and the intersections on those routes will provide me with the tertiary population centers. The idea is to create a convincingly 'organic' looking geography that maintains an internal consistancy that just happens to be my personal hobgoblin. Now you see why I called this post 'Secret Vices' - still we can't all be as interesting as Simon bleeding Guerrier.